Initially dual screens may seem a techy luxury that the average user would not need. 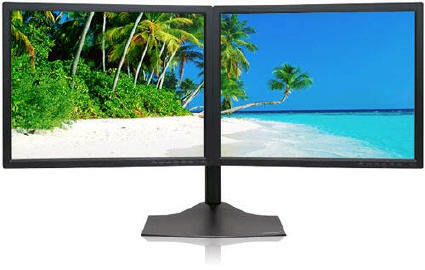 In actuality it can increase the productivity of any user by installing a second monitor. As two monitors can be used just as easily as one, the addition of a second requires no new learning curve and therefore immediately produces advantages. It is often that a user will find themselves referring to two different windows during work. Whether it’s an email inbox and an internet page or a calendar and an Excel spreadsheet, one window is rarely all that’s required. With only one monitor, the user must memorize the information from one window, minimize it, maximize the other window, and recall the information. This process is not only an inefficient use of time, it often ends in error as the information is not accessible at the time of input. Two monitors eliminate this loop entirely. Instead of repeatedly opening up and switching windows, a user can drag the spreadsheet they need to read to one monitor, and the email they are writing based on that spreadsheet to the other. No longer does accuracy depend on the memory of the user nor is time spent copying and pasting. The time saved may seem insignificant, but for every keystroke or mouse click saved, the user’s process becomes more efficient. In Smart’s experience, when first tested by the computer administrator in an office, the subsequent advice for the office wide implementation of a dual monitor setup from the administrator is often compelling enough for an entire company to do so. Call us and make the switch today!